BUNK BEDS: Manufactured in America by Strombecker in the 1950’s, is this set of wooden bunk beds. They can be arranged either as matching twin beds, or as a single bunk bed since they come apart easily. They also have their original ladder, which can be stored under a bed when not in use. The beds measure 10.5in/25cm long and are 9in/23 high when stacked. 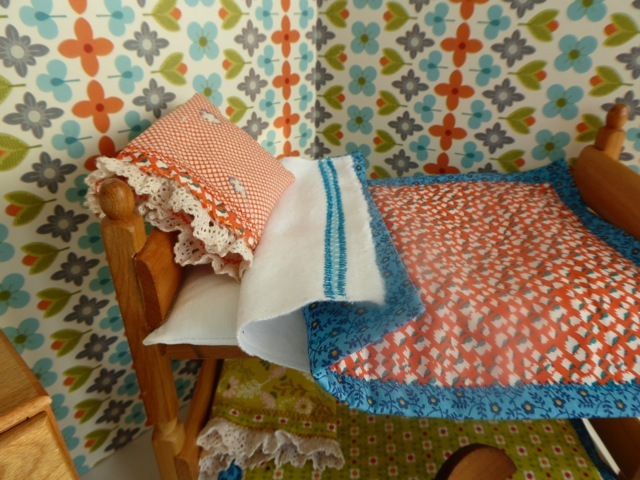 BED CLOTHES: As with all our beds, these bunks come with a lovely array of handmade bedding: a white cotton mattress, a soft brushed cotton blanket trimmed with turquoise edging, a reversible quilt and a pillow covered with a lace-edged pillowcase for each bed. 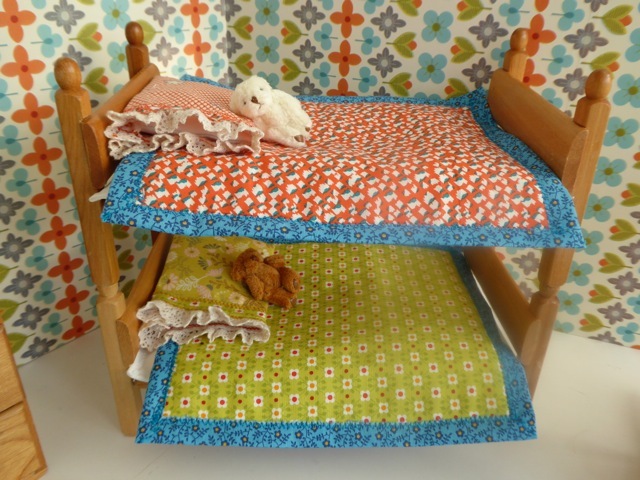 Most of our bedding is made with vintage, cotton fabric, and is completely hand-washable. In addition, there are two little teddy bears, who also sleep in the beds. CHEST OF DRAWERS: Also manufactured by Strombecker, is this solid, three drawer wooden chest - in fact designed at the time to be sold with the bunk beds. 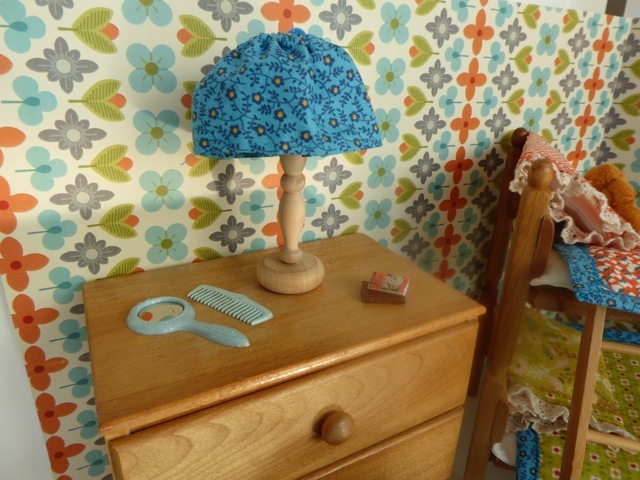 On top sits a handmade (non-working) lamp with a gathered fabric lampshade, a plastic comb and mirror, and two small books. RUG: A piece of printed, modern felt makes the perfect rug for the little sister to play with her vintage wooden animal toys. ROCKING CHAIRS: Both of these also date from the mid-century years, although we are not sure about the country of origin. Both are make from fine-grained wood and have wonderful mid-century styling. The larger one has a little cushion; the other one is for the little teddies. WALLS: Covered in a delightful vintage-inspired print, which has been mounted on two pieces of 5mm thick A3 foam board. Each piece of foam board measures 42x29.5cm or 11 5/8 x16 3/8in. 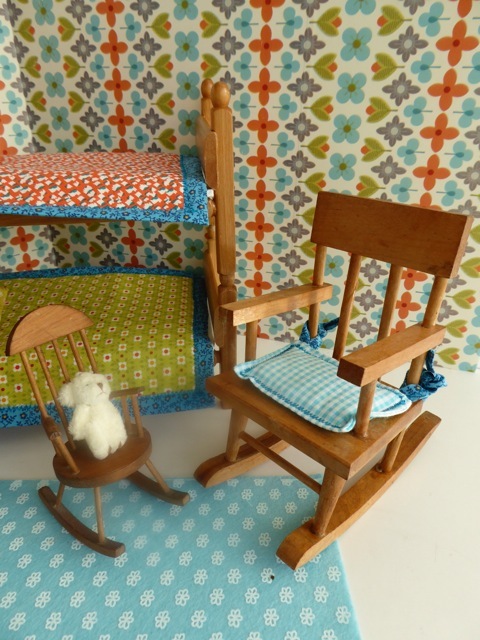 PRICE: For all the items shown in this room set £175.00 (excluding the dolls). DOLLS: Chosen from our selection of vintage dolls – please see the DOLLS section of this website for a greater choice. 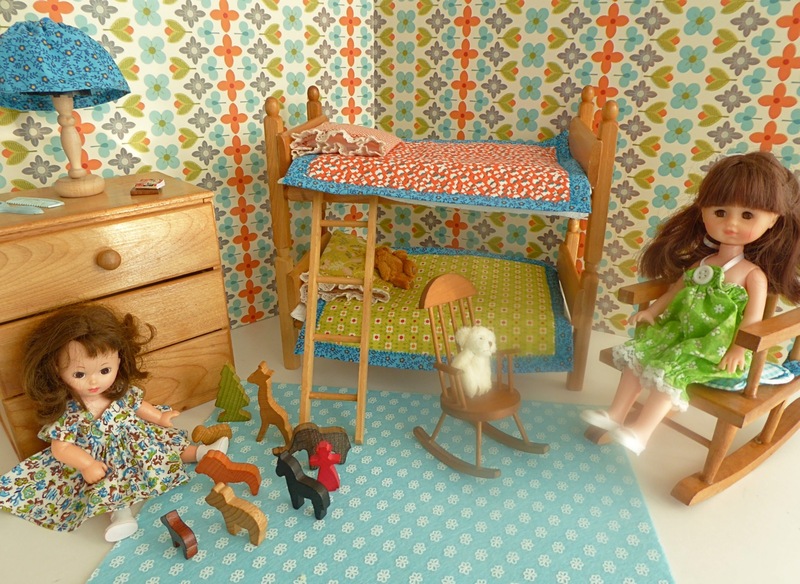 The dolls shown here are a brunette Garden Gals doll (on the left) wearing a vintage dress, while on the right is a brunette Lesney Ginny wearing a more modern playsuit. (We think they make wonderful sisters). Note: there are lots of other clothes available for these dolls– please see the CLOTHES and MISCELLANEOUS sections of our website for a small sampling of what is available, or contact us with your requirements.